Come Experience the Fresh, Seasonal, Mediterranean and Modern American Dishes and Ambiance and Décor of Our Award Winning BYOB Restaurant! 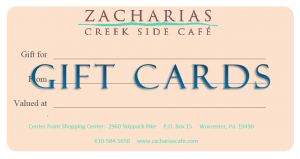 Buy Zacharias Creek Side Café Gift Cards Here! Contact us today for all of your on and off premise catering needs.